This is the organisation wiki for the openQA Project. If you are interested in the tests for SUSE/openSUSE products take a look into the openqatests project. New: No one has worked on the ticket (e.g. the ticket has not been properly refined) or no one is feeling responsible for the work on this ticket. Workable: The ticket has been refined and is ready to be picked. In Progress: Assignee is actively working on the ticket. Feedback: Further work on the ticket is blocked by open points or is awaiting for the feedback to proceed. Sometimes also used to ask Assignee about progress on inactivity. Blocked: Further work on the ticket is blocked by some external dependency (e.g. bugs, not implemented features). There should be a link to another ticket, bug, trello card, etc. where it can be seen what the ticket is blocked by. Rejected: The issue is considered invalid, should not be done, is considered out of scope. Closed: As this can be set only by administrators it is suggested to not use this status. It is good practice to update the status together with a comment about it, e.g. a link to a pull request or a reason for reject. You can use these templates to fill in tickets and further improve them with more detail over time. Copy the code block, paste it into a new issue, replace every block marked with "<…>" with your content or delete if not appropriate. As a reviewer of pull requests on github for all related repositories, e.g. https://github.com/os-autoinst/os-autoinst-distri-opensuse/pulls, apply labels in case PRs are open for a longer time and can not be merged so that we keep our backlog clean and know why PRs are blocked. The following use cases 1-6 have been defined within a SUSE workshop (others have been defined later) to clarify how different actors work with openQA. Some of them are covered already within openQA quite well, some others are stated as motivation for further feature development. product: the main "system under test" (SUT), e.g. "openSUSE"
version: one version of a product, don't confuse with builds, e.g. "Tumbleweed"
flavor: a specific variant of a product to distinguish differing variants, e.g. "DVD"
arch: an architecture variant of a product, e.g. "x86_64"
machine: additional variant of machine, e.g. used for "64bit", "uefi", etc. When reviewing test results it is important to distinguish between different causes of "failed tests"
A common definition about the status of a test regarding the product it tests: "false|true positive|negative" as described on https://en.wikipedia.org/wiki/False_positives_and_false_negatives. "positive|negative" describes the outcome of a test ("positive": test signals presence of issue; "negative": no signal) whereas "false|true" describes the conclusion of the test regarding the presence of issues in the SUT or product in our case ("true": correct reporting; "false": incorrect reporting), e.g. "true negative", test successful, no issues detected and there are no issues, product is working as expected by customer. Another example: Think of testing as of a fire alarm. An alarm (event detector) should only go off (be "positive") if there is a fire (event to detect) --> "true positive" whereas if there is no fire there should be no alarm --> "true negative". failing: the test is behaving as expected, but the test output is a fail --> "true positive"
passing: the test is behaving as expected, but the result is a success --> "true negative"
If in doubt declare a test as "broken". We should review the test and examine if it is behaving as expected. In this sense development+QA want to accomplish a "true negative" state whenever possible (no issues present, therefore none detected). As QA and test developers we want to prevent "false positives" ("false alarms" declaring a product as broken when it is not but the test failed for other reasons), also known as "type I error" and "false negatives" (a product issue is not catched by tests and might "slip through" QA and at worst is only found by an external outside customer) also known as "type II error". Also see https://en.wikipedia.org/wiki/Type_I_and_type_II_errors. In the context of openQA and system testing paired with screen matching a "false positive" is much more likely as the tests are very susceptible to subtle variations and changes even if they should be accepted. So when in doubt, create an issue in progress, look at it again, and find that it was a false alarm, rather than wasting more peoples time with INVALID bug reports by believing the product to be broken when it isn't. To quote Richard Brown: "I […] believe this is the route to ongoing improvement - if we have tests which produce such false alarms, then that is a clear indicator that the test needs to be reworked to be less ambiguous, and that IS our job as openQA developers to deal with". This categorization scheme is meant to help in communication in either written or spoken discussions being simple, concise, easy to remember while unambiguous in every case. While used for naming it should also be used as a decision tree and can be followed from the top following each branch. To keep it simple I will try to go in steps of deciding if a potential issue is of one of two categories in every step (maybe three) and go further down from there. The degree of further detailing is not limited, i.e. it can be further extended. Naming scheme should follow arabic number (for two levels just 1 and 2) counting schemes added from the right for every additional level of decision step and detail without any separation between the digits, e.g. "1111" for the first type in every level of detail up to level four. Also, I am thinking of giving the fully written form phonetic name to unambiguously identify each on every level as long as not more individual levels are necessary. The alphabet should be reserved for higher levels and higher priority types. Every leaf of the tree must have an action assigned to it. 112211 need needles update --> re-needle if sure, TODO how to notify? There are some features in openQA for reviewing test results and common practices. Some of these features are presented here based on the pull requests from github. On a tests result page there is a tab for "previous results" showing the result of test runs in the same scenario. This shows previous builds as well as test runs in the same build. This way you can easily check and compare results from before including any comments, labels, bug references (see next section). This helps to answer questions like "Is this a new issue", "Is it reproducable", "has it been seen in before", "how does the history look like". but only for each individual test result (1:1 relation). This is why this is done in each individual test result and not for a complete build. Remember that the higher the limit, the more complex the database queries will be increasing the lookup time as well as the load on openQA to generate the result. Find the always latest job in a scenario with the link after the scenario name in the tab "Previous results"
Should always refer to most recent job for the specified scenario. tests/latest?test=foobar - this searches for the most recent job using test_suite 'foobar' covering all distri, version, flavor, arch, machines. To be more specific, add the other query entries. See online documentation about review badges. This allows e.g. to show only failed builds. Could be included like in http://lists.opensuse.org/opensuse-factory/2016-02/msg00018.html for "known defects". Example: Add query parameters like …&result=failed&arch=x86_64 to show only failed for the single architecture selected. to show more builds but still limited by the selected number. By using advanced query parameters in the URLs you can configure the search for builds. for special investigation use cases with the advanced query parameters, e.g. if one wants to get an overview of a longer history. This applies to both the index dashboard and group overview page. See online documentation about build tagging. Using a new query parameter 'only_tagged=[0|1]' the list can be filtered, e.g. show only tagged (important) builds. as many failures are just having the same issue until it gets fixed. and has been activated for bugrefs. This is possible by adding the keyword pinned-description anywhere in a comment on the group overview page. Then the comment will be shown at the top of the group overview page. However, it only works as operator or admin. With Show bug or label icon on overview if labeled (gh#550) it is possible to add custom labels just by writing them. Nevertheless, a convention should be found for a common benefit. 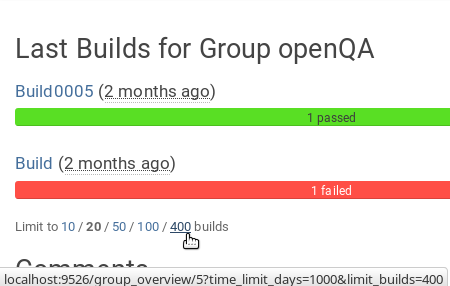 Beware that labels are also automatically carried over with (Carry over labels from previous jobs in same scenario if still failing [gh#564])(https://github.com/os-autoinst/openQA/pull/564) which might make consistent test failures less visible when reviewers only look for test results without labels or bugrefs. Labels are not anymore automatically carried over (gh#1071). List of proposed labels with their meaning and where they could be applied. needles for https://github.com/os-autoinst/os-autoinst-distri-opensuse/pull/1353 were missing, added by jpupava in the meantime. There is an ongoing effort to automate the LPAR creation and installation on z/VM. A first idea resulted in the creation of qnipl. qnipl enables one to boot a very slim initramfs from a shared medium (e.g. shared SCSI-disks) and supply it with the needed parameters to chainload a "normal SLES installation" using kexec. This method is required for z/VM because snipl (Simple network initial program loader) can only load/boot LPARs from specific disks, not network resources. example: snipl -f ./snipl.conf -s P0069A27-LP3 -A fa00 --wwpn_scsiload 500507630713d3b3 --lun_scsiload 4001401100000000 --ossparms_scsiload "install=http://openqa.suse.de/assets/repo/SLE-15-Installer-DVD-s390x-Build533.2-Media1 hostip=10.161.159.3/20 gateway=10.161.159.254 Nameserver=10.160.0.1 Domain=suse.de ssh=1 regurl=http://all-533.2.proxy.scc.suse.de"
Further details can also be found in the github repo. Pull requests, questions and ideas always welcome!